Dr. Daniel P. Keenan earned his Bachelor’s Degree from Villanova University in 1980 and his Doctoral Degree from The New York State College of Veterinary Medicine at Cornell University in 1984. Upon graduating from Veterinary School he moved to central New Jersey and began working at The Walnridge Equine Clinic where he remained until 1988. In 1988 Dr. Keenan began his own practice centered in the Bordentown area where he has remained ever since. In 2006 Dr. Keenan and Dr. Ron McAlister merged their practices to form Keenan McAlister Equine. Upon Dr. McAlister’s retirement in 2013, Dr. Makkreel purchased Dr. McAlister’s portion of Keenan McAlister Equine and Dr. Keenan and Dr. Makkreel began partners in ownership of what was to become Foundation Equine Wellness and Performance. 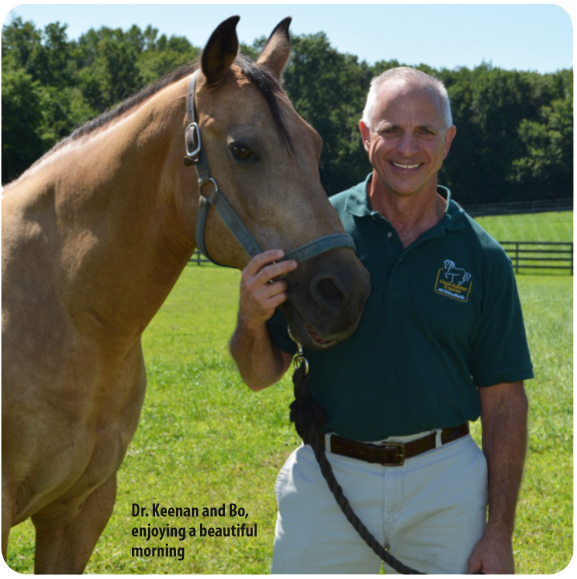 Dr. Keenan has served on many committees and boards concerning the equine industry both in New Jersey and nationally; including his current memberships on the Board of Directors of the American Association of Equine Practitioners (AAEP) and the Leadership Development Committee of that organization. In the past he has also served on the Professional Conduct and Ethics Committee and the Educational Programs Committee of the AAEP; as a past President and Treasurer of the New Jersey Association of Equine Practitioners; as Vice President of the NJ Horse Council; as a member of the New Jersey Board of Veterinary Examiners; as a member of the Executive Board of the New Jersey Veterinary Medical Association; as a representative to the New Jersey Agricultural Convention and on various other committees having to do with the equine industry in New Jersey. Dr. Keenan’s main veterinary interest lies in general and preventative medicine, reproduction and foal medicine. In his spare time Dr. Keenan enjoys spending time with his wife Teresa and his son Liam, and riding his mountain bike and his road bike long distances. He is an avid participant of the Anchor House Ride, a 500 mile bike ride that takes place each summer and benefits The Anchor House, a home for runaway and abused children in Trenton, NJ. Dr. Keenan is currently a member of the AAEP, AVMA, NJAEP, NJVMA, and the NJ Horse Council. Dr. Lynsey Makkreel was born and raised in Ontario, Canada to a family that had nothing to do with animals and not a single pet. Dr. Makkreel’s first career choice was to be the queen of England, but once she realized at the age of 4 this was not going to be possible, she somehow decided that she would become a veterinarian. At the age of 6 she went to her first week at horse camp and from then on, she did everything in her ability to be around horses. Dr. Makkreel graduated high school with every intention of going on to a career in veterinary medicine. Completing the prerequisite college courses within two years, Dr. Makkreel was admitted to the Ontario Veterinary College at the age of 20. Dr. Makkreel completed all four years of her veterinary education at the top of her class, winning numerous scholarships along the way. In her final year, she was nominated to apply for the prestigious Rhodes Scholarship. Having decided that she would pursue a career in equine medicine, Dr. Makkreel elected to complete an equine internship at Fairfield Equine Associates in Connecticut under the tutelage of Dr. Richard Mitchell, 7 time Olympic team veterinarian. It was during this year-long internship that Dr. Makkreel gained a tremendous amount of knowledge and expertise in lameness and performance medicine. Dr. Makkreel was then offered the opportunity to spend the winter season practicing her veterinary skills on top-notch show horses at the world class show grounds in Wellington, Florida. 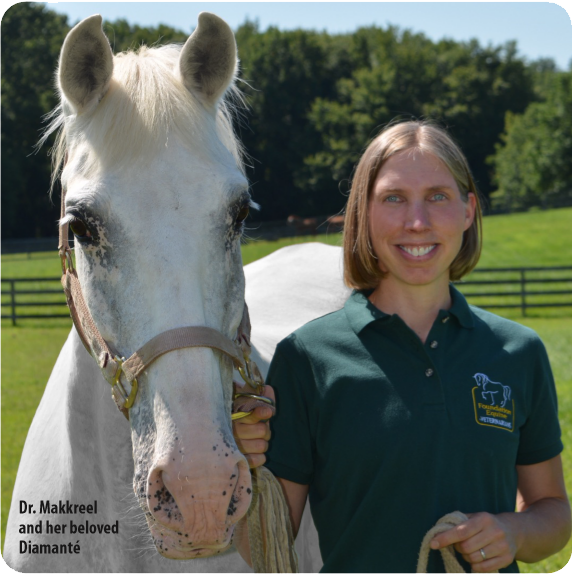 Dr. Makkreel joined Foundation Equine in 2006 as an associate veterinarian and became a partner in the practice in 2012. She quickly made New Jersey her home, and along with her wonderful husband Gerry, are enjoying their two beautiful daughters, Emily and Mia. Her family is complete with two horses and two cats. Music has always been an important part of Dr. Makkreel’s life having taken piano and singing lessons as a child. Before leaving Canada, she was part of a professional choral ensemble. Dr. Makkreel is currently a member of the NJ Chamber Singers, a small audition only ensemble that performs 8 concerts a year. Outside of music, horses and family, Dr. Makkreel spends most of her free time gardening. Dr. Talia Lin had the misfortune to ask for riding lessons from her un-horsey parents the same week Christopher Reeve fell off his horse. Fortunately, she has always been persistent and did eventually get said riding lessons, though she never managed to talk her parents into that horse. She went on to ride all through middle and high school and sneaked rides from anyone who would lend her a horse all through college (and still does). Dr. Lin majored in biology and environmental studies at Tufts University and then fled south for a stint working at a food and chemicals consulting firm in Washington, DC. After six months, she decided there weren’t enough horses in her office building and began working at the Marion DuPont Scott Equine Medical Center in Leesburg, VA, as a nursing assistant. Inspired by her work at MDSEMC, she then attended veterinary school at the Virginia-Maryland Regional College of Veterinary Medicine in Blacksburg, VA, and focused on equine medicine and surgery. Dr. Lin completed an internship at Durango Equine Veterinary Clinic in Buckeye, AZ, focused on theriogenology (reproduction) and ambulatory medicine. 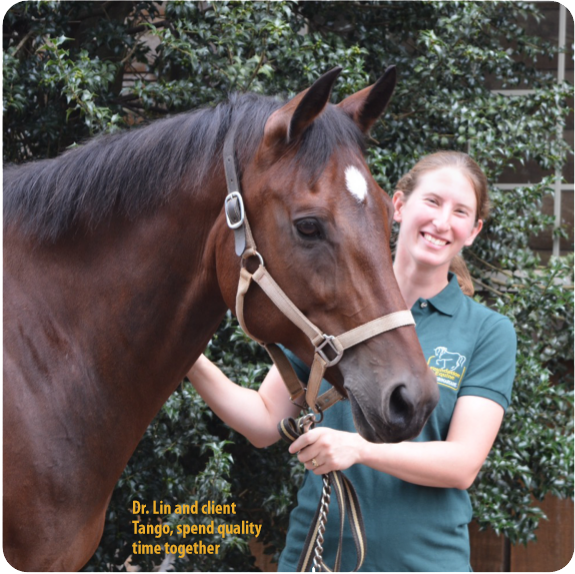 Joining the team at Foundation Equine in 2013, Dr. Lin continues to have a passionate interest in reproduction, and has branched out into the growing field of equine dentistry. Dr. Lin has taken multiple continuing education courses in this area, and continues to enjoy learning new ways to keep our equine companions chewing and performing their best. When not working, Dr. Lin enjoys hiking and traveling with her husband and friendly red-nosed pit bull. Dr. Sarah Bye grew up on a small farm in Bucks County, PA and competed in hunters, equitation and eventing with her first pony, a Connemara named Pogo. At twelve years old, she was given six feral miniature horses, several of whom she trained and successfully competed in combined driving and pleasure driving. After growing out of her pony, Dr. Bye competed in eventing with her off-the-track thoroughbred, Rocky, whom she continues to ride today. 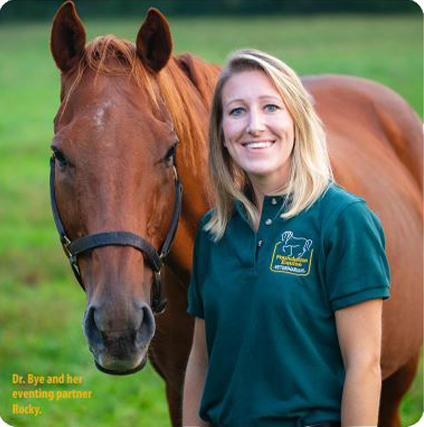 Dr. Bye obtained a bachelor’s degree in Biology and French from Wellesley College, then received her veterinary degree from Virginia-Maryland College of Veterinary Medicine with an equine emphasis. While in vet school she participated in service trips to Peru and Nicaragua with the United States Humane Society, aiding working horses in rural communities. In her final year of school, she received the “Outstanding Senior Award” which recognize exceptional academic achievement and leadership by a graduating student. Pursuing additional training, Dr. Bye completed an internship at Unionville Equine Associates in Oxford, PA, where she gained extensive experience in ambulatory medicine, sports medicine, surgery, and emergency and critical care. Joining Foundation Equine in 2018, Dr. Bye is thrilled to be back in the area with her dog, Cashew, and her horse, Rocky. Although Dr. Bye appreciates all aspects of equine practice, her special interests include lameness, sports medicine, and chiropractic care. Beyond work, Dr. Bye enjoys CrossFit, running and hiking with her dog, and spending time with family and friends. Rita Bliden grew up in Monmouth County and spent her free time as a teenager at nearby horse farms, taking lessons and doing any work that kept her in a barn. She eventually managed several farms, spent two years as an equine veterinary assistant, and served seven years as a Standardbred groom, racing at Freehold, Garden State Park, and the Meadowlands. 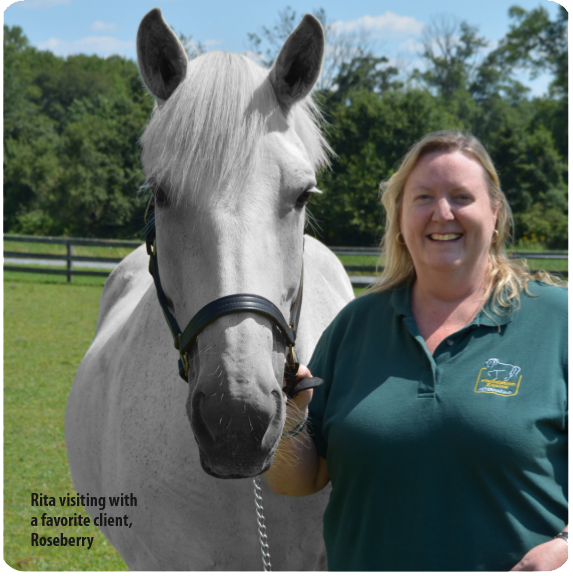 After fifteen years away from “equine employment,” Rita joined our staff in 2008 as accounts receivable and inventory manager and has been managing our practice since 2015. When not ensuring our office is running smoothly, you can catch Rita teaching her birds, Indie and Peaches, to speak, practicing Yoga, or country line dancing. After moving to North Hanover from Trenton, NJ, Cara Ippolito found her love for horses at a summer camp 17 years ago. She learned how to ride and take care of horses before getting her first horse, Ziggy, at the age of 12. While attending high school, Cara worked as a groomer and Veterinary Technician for small animal clinics. Although her love for all animals was limitless, she had a strong passion for horses. 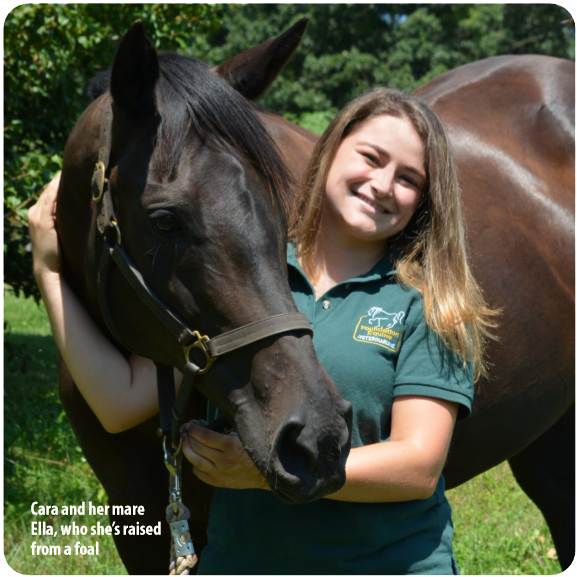 Working for Foundation Equine as a Veterinary Assistant gives her the opportunity not only work with horses everyday but to learn about the best ways to care for them. She currently has 2 Thoroughbreds, Ella and Sampson, 7 dogs, 5 cats, and 1 goat named Petey. Susan Jessen has been crazy about horses since her grandfather put her on one at 18 months old. In high school she baby sat, and worked in retail to earn the money for the weekly horseback rides with the school riding club. A retired Paramedic, she is still an active EMT and has provided emergency response coverage for various Monmouth and Ocean County Equestrian events. Susan is also on staff at Raceway Park, the Motorsports facility in Old Bridge, where she serves as an EMS supervisor, for a different kind of horsepower! She and her husband Bob moved to Jackson 23 years ago, and bought their home specifically because it was across the street from a horse farm, where they live there together with their cat “Thomas Jefferson”. Susan had wanted a horse since she was a very little girl, and at age forty finally got one. 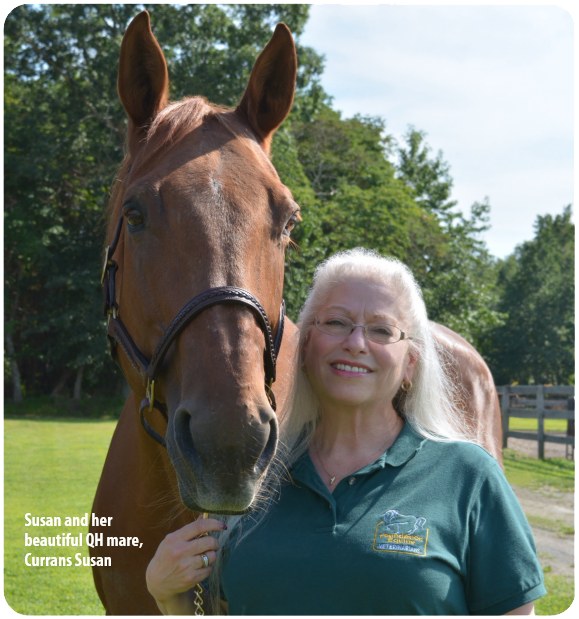 She and her mare, also named Susan, have been together for the past twenty years. “I was looking for a made gelding, and wound up with a green mare. Because her name was the same as mine, my trainer said it was meant to be”, and it was. When she is not working Susan can usually be found at the barn enjoying the companionship and relaxation she gets from her horse, and her “horsey” friends. Caitlin Sanford grew up in Trenton, NJ, always aspiring to ride and own her very own horse. After moving to Wrightstown, NJ, she started riding and taking lessons over a 10 year period, during which time she realized her passion was to work with horses. 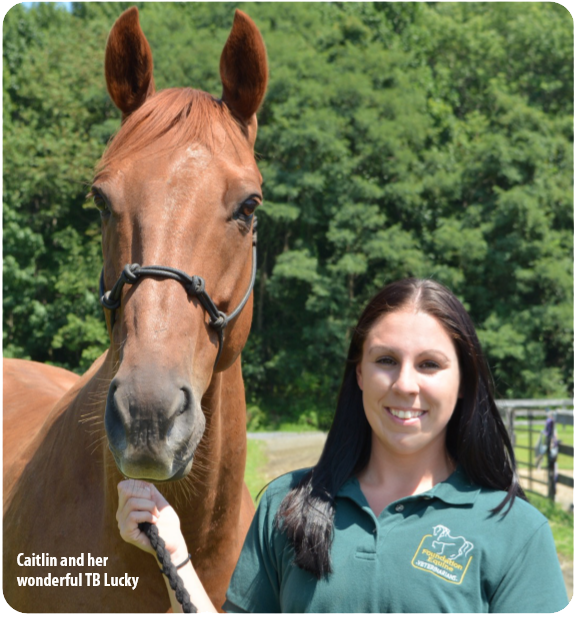 After over a year of working in a medical office, and finally owning her own horse, Caitlin can now pair those experiences with doing what she loves every day at Foundation Equine.